Milwaukee protests ICE raids | Fight Back! Voces de la Frontera rally and press conference outside ICE office in Milwaukee, Feb 24. 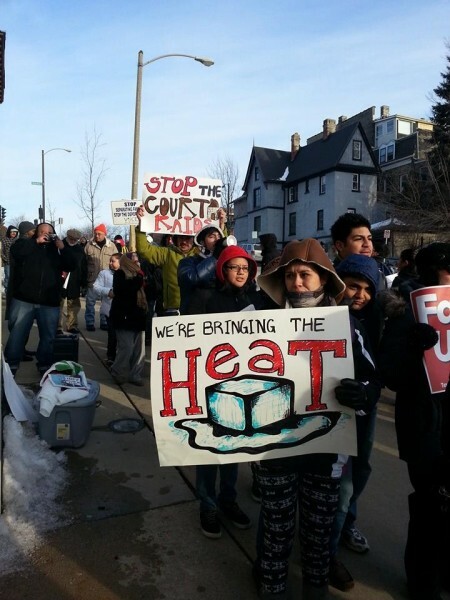 Milwaukee, WI - Taking a stand against courthouse intimidation by Immigration Customs Enforcement (ICE), immigrant rights organizers at Voces de la Frontera rallied outside the ICE office in downtown Milwaukee on February 24, 2014. On a freezing winter day, dozens of students, workers, and community members rallied in solidarity with the case of Jose Calderon and for all undocumented immigrants subject to ICE harassment at the courts. In a clear case of racial profiling, ICE is targeting Mexican and Central American people who come to court in southeast Wisconsin. ICE appears on days when Spanish interpreters are scheduled for court. Even witnesses to crimes are being harassed and threatened by ICE. Jorge Maya with Voces de la Frontera explained, “This type of racist, intimidating, and senseless practice that ICE conducts, has got to be ended. Undocumented immigrants should not be treated like criminals, families should not have to be separated, and communities should not have to be harassed just to keep up with a deportation quota." 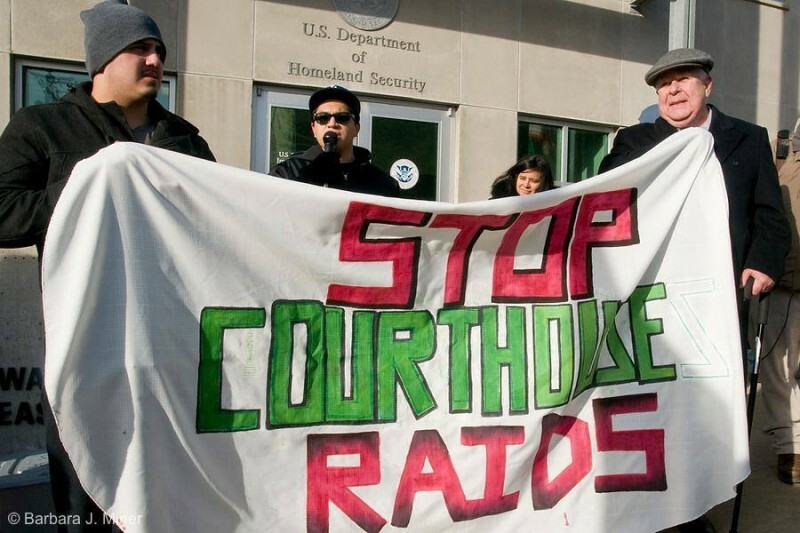 The case of Jose Calderon, a Voces de la Frontera member, sparked an outrage against ICE courthouse raids in Milwaukee communities. Calderon is facing deportation proceedings after paying a fine for driving without a license and attending a hearing. With no previous criminal record, Calderon’s deportation proceeding will be devastating to his two U.S.-born children. More and more, undocumented immigrants are detained at courthouses by undercover ICE agents, interrogated, and then sent for deportation proceedings. In an attempt to either pay a ticket, or serve as a witness to a crime, undocumented immigrants are subject to profiling by these clandestine ICE agents. Courthouses can be added to the list of worrisome places for undocumented people. The demands made by local movement leaders include: a meeting with the director of ICE, an investigation by ICE on the arrests and interrogation practices of its Milwaukee Field Office, and a plea to add courthouses to ICE’s list of sensitive locations, such as churches, schools, and shopping centers. Currently, undocumented immigrants are deported at the rate of 1,100 per day. ICE raids target workplaces, and even the homes of undocumented immigrants. March 2014 is when President Obama will reach 2 million deportations.